A quality tactical flashlight will come in handy for a wide variety of uses. They’ve always been useful for emergency or tactical situation, but they’re also becoming more popular for camping. Hunters, mechanics, and many others also make regular use of tactical flashlights to illuminate their immediate areas. The largest benefit of a tactical flashlight is that it will hold up to the rigors of a rough-and-tumble lifestyle much longer than a traditional flashlight or headlamp. You really never know when you’ll need a little extra light to make life so much easier. Some people always keep their tactical flashlight in the car, in a tactical backpack, or in a bug out bag, and it’s hard to blame them for doing so. In this article, we’ll review the Top Ten Tactical Flashlight of 2019 and discuss the most important factors to consider when it comes to picking out the best tactical flashlight. The Solaray Pro ZX-1 is a reliable, bright, and authentic tactical flashlight that will perform when you need it. Solaray’s motto is “We’ll never leave you in the dark.” And that rings true with this flashlight. Ranked as the best value, the Pro ZX-1 tactical series will quickly be your favorite light. Solaray is a dependable American brand with a 6-month warranty. For the price, it is difficult to find this kind of quality in a tactical flashlight. The Solaray Pro ZX-1 is an ultra-bright, lightweight flashlight. Capable of producing up to 1200 lumens, with 5 light modes and the option for rechargeable batteries or 3-AAA. The flashlight is water resistant and shockproof, being made out of a good quality aluminum alloy. The flashlight has some handy features like zoom and can be mounted on different kind of guns with proper equipment. The Streamlight ProTac 88040 HL Flashlight is a compact, programmable flashlight that is bright and powerful designed for long product life. This light is a favorite due to its brightness offered at an affordable price. The LED power regulation technology provides the most brightness out of each battery you purchase, which is important especially when the batteries are not rechargeable. Streamlight is known to produce quality products. They specialize in manufacturing tactical, weapon mount & safety rated flashlights, lanterns & headlamps, and other products for the military. This light is made from anodized aircraft aluminum to provide powerful protection. It is 1-meter impact resistance tested. This device is also waterproof to 1 meter for 30 minutes, adding to its durability. This flashlight uses C4 LED technology for extreme brightness lasting up to 50,000 hour lifetime. On the highest setting, is flashlight provides 750 lumens with a throw of up to 270 meters. The Fenix PD35 Tactical Edition is a pocket-sized, professional grade, quality tactical flashlight that boasts 1000 lumens on the highest setting. The PD35 is compact but yet a powerful flashlight that uses rechargeable or non-rechargeable batteries. Fenix is a leader in the field, and they continue to progress and develop new technology through their products for outdoor illumination and portable lighting. The body of this flashlight is made of durable aircraft-grade aluminum. It also has a premium type III hard-anodized anti-abrasive finish to protect against nicks and dings. The side switch for switching modes and outputs is made of stainless steel, so the switch won’t break with lots of uses. The light is a Cree XP-L(V5) LED with a lifespan of 50,000 hours. The SureFire G2X is a US-made tactical flashlight that is lightweight and compact, but still is very powerful. The flashlight is very simple in operation making it easy to use. SureFire is a leader in the industry and are one of the most trusted brands for good reason. They continue to produce quality products as well. They proudly make all their equipment in the USA. SureFire is a name known for high-quality tactical gear and often ends up on recommended lists. They are a well-recognized brand and have been around for many years and offers a lifetime warranty. The G2X is made of a lightweight, Nitrolon polymer that is very durable and provides a secure hold. The head of the light is made out of a Mil-Spec hard-anodized aluminum for added durability, especially if needed to be used as a weapon. Also included are O-rings and gasket seals to provide a barrier against moisture and dust. The SureFire G2X includes a variety of designs in the series: Pro, Tactical, CombatLight, and Law Enforcement. Each design has a slightly different body style so users can select the one that fits their grip best. The Ecogear TK120 Tactical is a budget-friendly tactical flashlight made out of high-quality material. The TK120 contains many features including a zoom lens allowing you to focus the beam. The flashlight can be used in multiple scenarios including camping, hunting, military, or night security. The TK120 is a military grade flashlight made of durable aluminum with a hard-anodized finish. The light is also water-resistant, anti-abrasive, and shock-proof. The TK120 has a CREE XML-T6 LED bulb which provides 900 lumens on the highest setting. However, when using the zoom feature the narrow beam of light can project up to 1200 lumens. The light also has a constant current and voltage circuit design which protect the LED emitter from possible internal damage. This light is slightly longer than many others on this list which provides added comfort when gripping. The extra size is also useful in a self-defense situation is the longer bezel provides a greater striking surface are. The J5 Tactical V1-Pro tactical flashlight is a very bright yet compact flashlight powered only by 1 AA battery. This is a perfect small flashlight that delivers powerful light and has lots of tactical features. The flashlight comes in at a budget-friendly price as well. J5 is another well-known name in the light industry. They continue to produce heavy-duty flashlights at affordable prices. This specific flashlight happens to be a bestseller on Amazon and is the best-selling flashlight from the J5 range. J5 offers a full warranty, if you are not completely satisfied with your purchase they will refund or replace the light guaranteed. V1-Pro is built to last. It is water-resistant with a built-in water-proof O ring. The body is made of a durable aluminum alloy. This light is small but intense at 300 lumens. It has a throw equal to two football fields (600 feet) which is impressive for its size. The Anker LC90 comes with an extra-powerful, 900-lumen Cree LED that’s capable of sweeping bright light across distances up to 660 feet (200 meters) and can reach a distance up to 1000 feet. It also has a fully zoomable beam that goes from wide to narrow and gives you the ability to toggle between five adaptable settings, including high, medium, low, strobe, and SOS. This tactical flashlight lasts up to six hours on a single charge and features a 3500mAh rechargeable battery that can be fully recharged in just six hours. The flashlight’s LEDs boast an extended 50,000-hour lifespan. The whole package has a water resistance rating of IP65 and is designed to keep working in heavy rain. It also has a durable aluminum body that’s resistant to shock and can endure rough handling. This upgraded tactical flashlight from Klarus comes in a Super Bundle that includes a USB charging cable, lanyard, spare O-ring, rechargeable battery, holster, pocket clip, car charger, wall adapter, and a mini USB light. It includes a Cree LED light that can achieve a maximum output of 2000 lumens. The upgraded version was designed for one-handed operation and includes a side switch for easy use when you don’t have both hands readily accessible. The Klarus XT11GT offers a number of functional modes, including Straight 2 Strobe, Instant Turbo, Instant Low-light, Memorized Function Ability, SOS, and much more. The flashlight’s 18650mAh rechargeable battery can be recharged using a standard micro-USB cable and the included capacity indicator allows you to control your usage based on the battery’s remaining charge. The Helotex G4 Tactical flashlight is a strong, high-performance flashlight that will withstand any endurance test. The G4 has a high function that produces 1000 lumens making it a very bright and powerful flashlight. Helotex is a well-known brand in the flashlight space. They are a great mid-level option in the tactical flashlight industry. The G4 has an extremely powerful LED bulb to illuminate whatever situation you find yourself. This is one of the most trusted brands in the flashlight space. The convenient size of the torch makes it a great EDC option, to make sure you have it easily available whenever you need it. This light is made of anodized 6063-T6 Aircraft Aluminum for extreme strength and protection. It also has o ring seals on all parts for extra protection against the elements. The Helotex G4 has dual power capability to run either on two CR123 batteries or a single 18650 rechargeable battery. The Outlite A100 Tactical Flashlight is a quality, budget-friendly, multifunction flashlight designed to be useful in many different situations. The Outlite A100 is a versatile and reliable flashlight, with light modes to accommodate whatever situation you find yourself in. The light has an extremely bright beam, making it a great choice for anyone in the police force, military, or security. The versatility also makes it a great option for hunting and camping trips as well. The Outlite A100 is a great 5-mode capable tactical flashlight. With dual power options and zoom lens, this light has earned its spot in our top ten list. The A100 comes in at a great price and is the #1 Seller on Amazon. The flashlight is light but still seems to be made with good quality. The flashlight comes loaded with different features allowing it to be utilized in different situations. The right tactical flashlight for you can largely depend on your personal preferences. But with that said, it’s important to learn more about the technical specifications of tactical flashlights and the many factors to consider before actually making a purchase. In this Buyer’s Guide, we’ll discuss lumens, size, material, price, battery life, and mode functions. Lumens measure how bright the LED light or lightbulb is. Lumens are actually a measure of energy that your light is capable of emitting. In short, a higher lumens count equates to higher light intensity (brighter light). But it’s also important to know that a higher lumens count also means that the flashlight will generate more heat. Not all tactical situations call for the brightest light possible, so it’s important not to get caught up in finding the highest number possible when it comes to lumens. A higher lumens count can, sometimes, also lead to the flashlight dying more quickly. Tactical flashlights come in a variety of brightness levels. Many also include features such as power saving and turbo mode to help regulate the lumen level depending on your situation. This is an important factor when deciding on a tactical flashlight. If your primary use is an EDC (everyday carry) flashlight, you will want something compact and pocket- sized. In this case, look for a tactical flashlight with a length less than five inches so that it fits comfortably in your pocket or wherever you intend to store it until needed. If your primary use is for camping or for an emergency situation, however, a bigger flashlight might be a better fit for you. Most quality tactical flashlights are made from anodized aluminum. This technique creates a level of hardness on the aluminum and varies in strength depending on the procedure and quality of the aluminum. It also increases the metal’s resistance to rust and corrosion and will make the exterior casing of the flashlight less likely to chip and/or peel when dropped or exposed to the elements. If you are looking for a durable flashlight, it’s important to search for one that features anodized aluminum, although other metals, such as magnesium and titanium, can also be anodized. 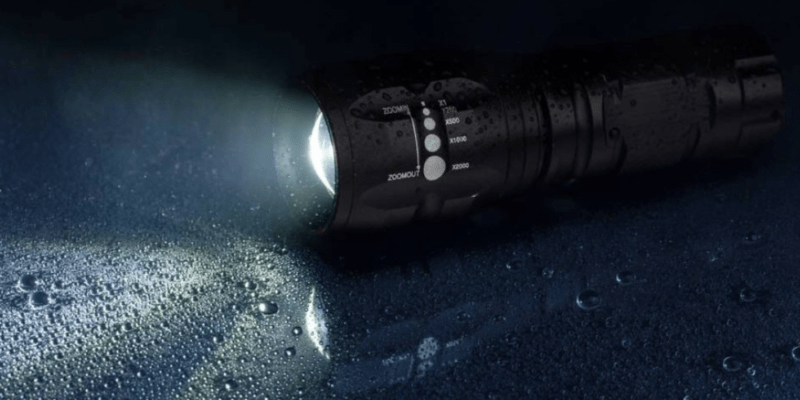 A tactical flashlight that is ‘water resistant’ should give you the ability to use it in heavy rain without compromising any of its components. These models can generally only withstand use in heavy rain for short periods, but won’t stand up to being dropped in a puddle or submerged in any liquid for any amount of time. If you find a tactical flashlight that is truly waterproof, however, it will stand up to a brief swim in a puddle even if it takes you several minutes to locate it. When investigating a flashlight’s level of water resistance, it’s important to familiarize yourself with the International Protection Rating system. Most tactical flashlights have the option of using a normal battery or a rechargeable battery. They primarily rely on a Lithium-ion battery (or batteries) that is backed up by more conventional alkaline batteries. The major advantage of Lithium-ion batteries is that they provide a higher voltage and higher current rates than conventional batteries. Battery usage rate can vary greatly from model to model, so it’s very important to look closely at a tactical flashlight’s technical specifications for battery life before buying. Generally speaking, you’ll want a flashlight with a rechargeable battery and battery charger if you plan to use it quite frequently. The downside of these flashlights is that they’re totally useless if you forget to charge them before you head out, or if you forget to bring a backup battery along. Fortunately, many of the best tactical flashlights on the market offer various brightness settings that allow you to dial brightness back so that you can preserve your battery life. Some even feature a battery level indicator that lets you know just how long you have before you’re out of battery. The best tactical flashlights come with a host of bells and whistles. These bells and whistles present themselves in the form of varied features, modes, and programmable ability. Some of these features include extreme brightness, strobe, beam, zoom, or other tactical modes. In short, a tactical flashlight that offers more features will ultimately prove to be more adaptable to the complex number of situations you might encounter in the field. If you’re not particularly sure of how you’ll be using your flashlight, it pays to have one that’s highly adaptable. However, more complexity doesn’t always serve everyone equally. If you’re very clear about the way you want to use your tactical flashlight, you might not need all those bells and whistles. In this case, you’ll be better off opting for a similar, but still highly effective, setup. Price is a big one when it comes to tactical flashlights. There seems to be a wide variety of prices and quality in this field. If you plan on using your flashlight frequently and depend on it, make sure you invest in a flashlight that is at a little higher price-point. When it comes to tactical flashlights, for the most part, you get what you pay for. While tactical flashlights can range from less than $20 to upwards of $100, most decent models should fall somewhere in the $25 to $30 range. With that said, it’s important that price isn’t the ultimate determinant of the flashlight you buy, as the best choice for you should largely be based on the other factors we’ve mentioned above. After you’ve considered all of the factors in our Buyer’s Guide, your final choice of the best tactical flashlight for you really comes down to how you plan to use it. Depending on your primary activity, the best flashlight for you will vary. In this section, we’ll answer some of the most common questions about the tactical flashlights that are best for specific situations. What is the Best Tactical Flashlight for Self Defense? When looking for a tactical flashlight for self-defense you want a flashlight that is extremely bright. In the event of an encounter, a bright flashlight can temporarily blind the intruder and buy you some time. What is the Best Tactical Flashlight for an AR15? You want a flashlight that is bright, durable, and has a strobe function. A strobe light from a tactical flashlight can disorient an attacker and provide you valuable time. You also want a flashlight that is easily mountable. We recommend the SureFire X300. What is a Tactical Flashlight used for? There are many different uses for tactical flashlights. A lot of people consider a tactical flashlight a crucial item in their bug out bag checklist. Tactical flashlights can also be used for self-defense since they are bright, made out of sturdy metal, and some have bezel edges. Many people carry them in emergency car kits and survival kits. How many lumens should I look for in a tactical flashlight? With advances in technology even small and compact flashlights have high lumens. Typically anything in the 300-1000 lumen range will be great for any job. Anything higher than 1000 lumens is usually used by emergency personnel and search and rescue. Tactical flashlights are very popular. They have a wide range of functions and, most importantly, help to light up areas that would otherwise be left in the dark. There’s really no telling exactly when a tactical flashlight will come in handy, which is why many people keep them on their person as an everyday carry item. At the very least, a tactical flashlight should make the cut on a bug out bag checklist, survival kit, or in a car kit.